Real tragedy, in the Greek sense, requires a fatal flaw to play out its inevitable horrid consequences. Pride in its extreme form, hubris, is a classic device. The ongoing drama provides two forms of fatal pride. But the other more complex tragedy lies closer to home, with the enforcers of PC orthodoxy. Their own hubris blinds them to the dangers of Islamism affecting them. For them, there can be no life and death struggle to the end, despite explicit Islamist rhetoric to the contrary. That is simply unthinkable. They take for granted their own power to manage the struggle. There is no war with a victory or a defeat. There is only a conflict resolution process to be managed. It is unhelpful, therefore, for us to aggravate matters by fighting the enemy. Bush's War is the problem. Kerry's only fight Wars of Last Resort doctrine seems like waiting until we have no choice but to go a bit Roman. We redeploy from Iraq, and try and manage the conflict; I think it's the War of Last Resort we'll find ourselves fighting. Also read Ahmed Al-Jarallah: Arrogance is a Very Dangerous Disease. Others in the middle east see what could easily be coming. The Australian on Clinton: "there's no limit to how much credit a man can get, if he doesn't care what he's actually done". IN a passionate and emotional television interview, former US president Bill Clinton has launched an extraordinary attack on the analysis that he failed to properly respond to the rising terror threat posed by Osama bin Laden and al-Qa'ida. In doing so, Mr Clinton has highlighted his acute sensitivity to an issue that haunts his legacy in the wake of al-Qa'ida's September 11, 2001, attacks on New York and Washington DC. For some commentators, Mr Clinton's outburst has been an exercise in narcissistic revisionism. For others, by confronting the issue head-on Mr Clinton is expressing frustration at perceived double standards that leave him feeling misrepresented and attempting to clear some obstacles for his wife, Hillary Clinton, in her anticipated run for the Democratic nomination for the US presidency. The timing of Mr Clinton's outburst coincides with jockeying for the mid-term congressional elections, in which President George W. Bush is seeking to rally flagging public support for the conflicts in Iraq and Afghanistan. In the interview on the US Fox network, Mr Clinton made an obvious admission of failure, that he did not get bin Laden, which may have headed off the 9/11 attacks. But he asserted that his fiercest critics now were also his fiercest critics then. Republicans who now say he did not do enough at the time claimed he was too obsessed with bin Laden. They had advised an immediate withdrawal from Somalia in 1993 after the Black Hawk incident in Mogadishu in which 17 troops were killed. Mr Clinton refused and maintained troops for six months to enable an orderly transfer to the UN. It was fair, Mr Clinton said, to criticise him for not being able to push ahead with battle plans to go into Afghanistan, overthrow the Taliban and launch a full-scale search for bin Laden following the attack on the USS Cole in October 2000. But this was at the end of his presidency, after years of provocation by bin Laden - that started one month after he was sworn into office, with the first bombing attempt on the World Trade Centre in New York in 1993. After Somalia later that year, there was a plot to down 11American planes over the Pacific in 1994, and then a car bomb in Riyadh, Saudi Arabia, in 1995 that killed five Americans. The following year, American pilots were bombed in Iraq. In 1997, bin Laden made a declaration of war against the US, leading to the bombing of its embassies in Kenya and Tanzania. In 1999, a plot was foiled for a series of bombings, including in Los Angeles, and in 2000 there was the bomb attack against the USS Cole, which killed 17 sailors. Throughout the provocation, Mr Clinton rejected a full-frontal engagement as launched by Mr Bush in the wake of the September 11 attack. In hindsight, justification was there from the first World Trade Centre bombing. When he did act, towards the end of his presidency, Mr Clinton's efforts were thwarted by a lack of cabinet support or by bureaucratic inertia. Despite this, he claims he got closer to killing bin Laden than anybody since. Mr Clinton's outburst has prompted unfavourable comparisons not just with George W. Bush but also former Republican president Ronald Reagan, who is credited with the political and financial brinkmanship that ended the Cold War with the Soviet Union. The argument goes that whereas Reagan would say "there's no limit to what a man can do if he doesn't care who gets the credit", Mr Clinton's motto is a revised "there's no limit to how much credit a man can get, if he doesn't care what he's actually done". Roger Simon has an interview with Lieberman here. Sudan, and Somalia, for instance. Arab rulers dispatch their fanatics to such places in the hope that they never return. Thus, Iraq is not a jihadist incubator, but rather a jihadist dumping ground. The NIE argues that, "Should jihadists leaving Iraq perceive themselves and be perceived to have failed, we judge fewer fighters will be inspired to carry on the fight." But the point is that jihadists should never leave Iraq--except to reap their heavenly reward. We should start to see Iraq the way Arab regimes see such jihad-zones, as a far away place for Muslim fanatics to go and die. But unlike those Arab regimes, we can't rely on someone else to do this dirty job for us. CENTCOM just posted a translation of a letter found past June. Here is CENTCOM's commentary on it. A translation follows (it's long letter). HT The Anchoress. According to `Atiyah, Zarqawi’s widening scope of operations, culminating with the November 2005 hotel bombings in Amman, Jordan, has alienated fellow Sunnis and reduced support for the global al-Qa`ida movement. In this vein, `Atiyah instructs Zarqawi to avoid killing popular Iraqi Sunni leaders because such actions alienate the very populations that al-Qa`ida seeks to attract to its cause.3 `Atiyah also encourages Zarqawi to forge strategic relationships with moderate Sunnis, particularly tribal and religious leaders, even if these leaders do not accept Zarqawi’s religious positions. `Atiyah instructs Zarqawi to follow orders from Usama Bin Laden and Ayman al-Zawahiri on major strategic issues, such as initiating a war against Shiites; undertaking large-scale operations; or operating outside of Iraq. `Atiyah goes on to criticize Zarqawi’s board of advisors in Iraq for their lack of adequate political and religious expertise, and he warns Zarqawi against the sin of arrogance. Because al-Qa`ida is in what `Atiyah calls a “stage of weakness,” `Atiyah urges Zarqawi to seek counsel from wiser men in Iraq— implying that there might be someone more qualified than Zarqawi to command al-Qa`ida operations in Iraq. `Atiyah closes with a request that Zarqawi send a messenger to “Waziristan” (likely, Waziristan, Pakistan) in order to establish a reliable line of communication with Bin Laden and Zawahiri. `Atiyah confirms in the letter that al-Qa`ida’s overall communications network has been severely disrupted and complains specifically that sending communications to Zarqawi from outside of Iraq remains difficult. Interestingly, he explains how Zarqawi might use jihadi discussion forums to communicate with al-Qa`ida leadership in Waziristan. `Atiyah’s unequivocal confirmation of the Zawahiri letter’s legitimacy, his authoritative tone, and his insider knowledge, indicate that he is among the highest ranking leaders in al-Qa`ida. But unlike most of al-Qa`ida’s known senior leadership, who remain isolated in the tribal areas of Pakistan or under house arrest in Iran, `Atiyah appears to have remarkable freedom of movement and a functional communication network. The final four paragraphs from Nina Easton's profile on Emanual. I like him. I agree with his comments on Iraq and Saddam. I just wish we could drop this Untouchables thing everytime someone outside Chicago writes about us. A Taliban commander, Mullah Hayat Khan, declared that Ms Amajan had been "executed". He said: "We have told people again and again that anyone working for the government, and that includes women, will be killed." Ms Amajan had taken over the post of women's welfare officer soon after Mullah Omar, the Taliban leader, fled with the fall of his regime. With the return of the Taliban, as the "war on terror" moved on to Iraq, aid workers - foreign and Afghan, men and women - were intimidated into leaving the region. Ms Amajan was one of the few who refused to flee. Her secretary, Abdullah Khan, said: "She was very brave. She was also very hard-working. She was always trying her best to improve education for women." As well as defying the Taliban, Ms Amajan made the mistake of being successful in what she was doing. In Kandahar alone she had opened six schools where a thousand women had learnt how to make and then sell their goods at the market. She was also instrumental in setting up tailoring schools for women, with some of the products making their way to markets in the West. Bill Lucy, a member of the AFL-CIO executive council and head of the Coalition of Black Trade Unionists, said the seven members of the team had been stopped at passport control at Harare's international airport and told they were not welcome. "(Zimbabwe's) security and police forces have to be condemned worldwide for this kind of harsh treatment," Lucy told a news conference in Johannesburg, adding that all members of the delegation had valid Zimbabwean visas. "We condemn the government of Zimbabwe's decision today ... to deny entry to a delegation from the United States Coalition of Black Trade Unionists," State Department spokesman Tom Casey said in a statement, saying the delegation was refused entry at the last moment despite having the proper visas and being scheduled to meet people inside and outside the government. "The Zimbabwe government's decision comes after the brutal suppression of a planned peaceful demonstration by the Zimbabwe Congress of Trade Unions," Casey added. "This is yet another example of the Zimbabwean government's failure to allow freedom of expression and ideas." I'm still sticking with my bet with Rich Miller that Lamont won't break his primary total. This guy is going to crash. Kevin Rennie in the Hartford Courant. Candidate Lamont is keen to call for more corporate responsibility from the likes of Wal-Mart and Enron. He made the obligatory appearance at a protest of Wal-Mart this summer. Lamont, however, won't say much about corporate shenanigans closer to home. His wife, Ann Lamont, is a formidable venture capitalist. And while piling up their millions, there have been a few casualties. The Lamonts won't disclose details, but public documents reveal that Ann Lamont was successfully sued for securities fraud in 1999 for her role in a disastrous public offering of stock by a Florida medical management company that went bust in a big way. Ann Lamont and other defendants entered into a multimillion-dollar settlement with fleeced shareholders. Some of the records are sealed, and the Lamont campaign won't reveal how much of the settlement Ann Lamont had to pay in 2001 to get out of the mess. Substitute the name of, say, Lynne Cheney for Ann Lamont and imagine the outrage on the left for such a doomed scheme. Some folks explain over here. Jonah Goldberg on Jihad Enablers and Ratzinger's Regensberg Speech. Reminds me of when the Ford Foundation made the grants to Jeff Fort and the Blackstone Rangers in the late 60s. The many learned disquisitions on the pope's speech notwithstanding, this isn't about theology either. After all, no serious person can take lectures on religious tolerance from the Muslim world very seriously. Spare me tales of Jewish accommodation in the 15th century. Today, throughout the Muslim world, Jew-hatred and Christian-bashing are commonplace, state-sanctioned and fashionable. No, this is about us. The best book for illuminating what's going on in the Muslim "street" isn't some weighty treatise on Islam; it's a short little tract called "White Guilt" by Shelby Steele. The book isn't even about Islam. Steele focuses on white liberals and the black radicals who've been gaming them ever since the 1960s. Whites, he argues, have internalized their own demonization. Deep down they fear that maybe they are imperialistic, racist bastards, and they are desperate to prove otherwise. In America, black radicals figured this out a while ago and have been dunning liberal whites ever since. The West is caught in a similarly dysfunctional cycle of extortion and intimidation with Islam, but on a grander and far more violent scale. Whether it's the pope's comments or some Danish cartoons, self-appointed spokesmen for the Islamic street say, "You have offended a billion Muslims," which really means, "There are so many of us, you should watch out." And if you didn't get the message, just look around for the burning embassies and murdered infidels. They're not hard to find. The signers of this statement include supporters of the decision to go to war in Iraq and others who opposed this decision from the beginning. Despite our agreement about many things in this manifesto, our differences on this issue remain. Our group includes signatories who view the war as a failure and a diversion from the struggle against radical Islamists. They therefore advocate an American withdrawal at the earliest possible time, especially in light of Sunni-Shia sectarian violence enveloping that country. However others amongst us point to the fragile beginnings of democracy after dictatorship and think success there is still possible and essential. In their view an American exit before stability and security are established would be a disaster for international and national security and would be seen in many parts of the world as a victory for radical islamists and unreconstructed Baathists. Liberals have important contributions to make in the struggle against the Islamic extremists. Indeed, we believe that this struggle's successful outcome depends in part on our engagement on the basis of deeply held values and traditions. This a remarkable speech. I can't recall an American President talking this realistically about American ideals. Call me an Imperialist; from Lewis's column which you should read in full. What is the possibility of freedom in the Islamic world, in the Western sense of the word? If you look at the current literature, you will find two views common in the United States and Europe. One of them holds that Islamic peoples are incapable of decent, civilized government. Whatever the West does, Muslims will be ruled by corrupt tyrants. Therefore the aim of our foreign policy should be to insure that they are our tyrants rather than someone else's--friendly rather than hostile tyrants. This point of view is very much favored in departments of state and foreign offices and is generally known, rather surprisingly, as the "pro-Arab" view. It is, of course, in no sense pro-Arab. It shows ignorance of the Arab past, contempt for the Arab present, and unconcern for the Arab future. The second common view is that Arab ways are different from our ways. They must be allowed to develop in accordance with their cultural principles, but it is possible for them--as for anyone else, anywhere in the world, with discreet help from outside and most specifically from the United States--to develop democratic institutions of a kind. This view is known as the "imperialist" view and has been vigorously denounced and condemned as such. “It appears Iran has opened three fronts in the eastern part of the Middle East and is increasing or decreasing the heat in Iraq, Lebanon, and the Gulf region depending on the pressure on its nuclear program. Currently all these fronts are on high alert as Iran’s confrontation with the international community has reached a peak and the deadline for imposing sanctions and punishment has come close. “Tehran’s battlefront in Iraq extends all the way to the south. The recent firing along Kuwait’s borders with Iraq, coinciding with the visit of UN Secretary-General Kofi Annan to Tehran and his warning to Iranian President Mahmoud Ahmadinejad, is raising suspicions. Ahmadinejad’s choice of the Cold War language indicates Iran’s internal situation is dangerous because of its economy, which is in crisis. “With his extremist methods and by creating international and regional disputes the Iranian President is trying to divert the attention of his people from the internal crisis. This was evident when Ahmadinejad accused Gulf states of standing with the international community and threatened to burn the entire Gulf region if people of the region dared to stand in the way of Tehran’s nuclear program. “Ahmadinejad has no right to accuse Gulf states or impose his authority over them. We see his threats as a ‘killing arrogance,’ which will eventually end him, because these cannot be considered a politically noble or a wise move. All of us remember how the Gulf states stood against the Shah of Iran when he was trying to play the role of a regional policeman. We also remember how the Ayatollah Ali Al-Khomeini’s Islamic revolution ended the Shah’s dreams. “Now Ahmadinejad wants to play the same role while trying to convince us that the Islamic Revolution in Iran was not meant to implement the aggressive and greedy policies of Tehran to expand its influence all over the Gulf. Ahmadinejad, who represents the peak of Persian ambitions, is acting the role of a regional policeman with such arrogance that he has challenged US President George Bush to a debate. The President of Iran wants to debate the issue of reforming the international system when he is incapable of reforming the system in his own country. “We say these words because Iran is an important neighboring country, which should play a cooperative role in tune with the importance of this strategic region. We don’t want Iran to become a victim of its own arrogance and meet the same fate of Japan, which was defeated in the World War II following the dropping of atomic bombs on Hiroshima and Nagasaki. Iran should know even a small spark can ignite a huge fire. World War I was the result of the assassination of the Austrian Crown Prince and World War II was sparked by the ambitions of Adolf Hitler. Marty gives us a perfect example of how some Liberals just doesn't get it on extremists Islam. Here's his comments in today's Sun Times on Benedict's Regensburg speech. We live today not in the time of Christian Crusades and Inquisitions, but in a time when the pope is needed as a bridge-builder, a linkmaker. Having quoted claims seven centuries old that only "evil and inhuman" things were new in the program of the prophet and in the name of Islam, it will be harder for the pope to have dialogue with the Muslims who do good and human things. Some on the Muslim and American right seem to be craving a war of civilizations, a war about which we know only one thing: Both sides (or the many sides) would lose. Rather than point to the "evil and inhuman" nature of Islam's, Judaism's, Christianity's, Hinduism's, Buddhism's and other holy wars, the pope will serve better if he can still find dialogue partners in search of the good and human. Ratzinger's fails as bridge builder. Yet Marty has not a word on the extremist Muslim clerics calling for Benedict's murder. They get a pass. The standards Marty uses to judge the Pope just don't apply to Muslims. The violent demonstrations, a murdered nun, the calls for the Pope's murder don't even qualify for Marty's criticism or suggest to Marty we may be up against a foe who's not going to be appeased. A few weeks ago, two reporters forced at gun point to convert to Islam. Danny Perl never had an option to convert, but beheaded after saying I am Jew. I wonder what Marty would do in similar situation. Or what his pastoral guidance would be to a Luthern soldier should they find themselves captured. Build a bridge to the terrorist holding the sword over ones head? Liberal religious wonder why our Churches bleed members. It's because people listen to mumbo jumbo like this from Marty and tell themselves something has indeed been lost here. Evil has gone right over Marty's head. He ignores the rest of the world. Marty doesn't take the hijacking of Islam by the likes of Assad, Nasrallah and Ahmadinejad seriously. Maybe he doesn't think it's worthy of him. No idea who gave it to him but here are some comments others had made on the email. 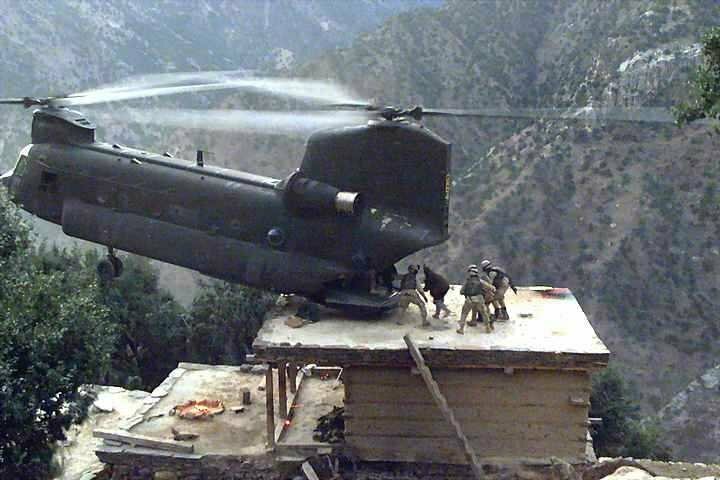 This photo of a hell of a rescue mission was taken by a soldier in Afghanistan. The pilot is a PA Guard guy who flies EMS choppers in civilian life. 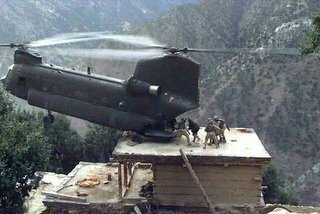 Now how many people on the planet you reckon could set the rear end of a chopper down on the roof top of a shack on a steep mountain cliff and hold it there while soldiers load wounded men in the rear??? If this does not impress you ..... nothing ever will. military helicopter pilots are trained in things like that -- semi-hovering while part of the helicopter is resting on a surface so people or cargo can be loaded or unloaded. We even did it in Hueys in training. It's tricky, but it can be done. A Huey pilot in my Vietnam outfit received the Congressional Medal of Honor for repeatedly doing that on a river bank under fire to rescue some Special Forces troops. Training doesn't make in any less impressive, of course -- just believable. Sunday’s rally, and the anti-genocide movement it embodies, is essential. Without it, the Bush administration would reflexively focus on Iraq, Iran, and North Korea and leave Darfur to be managed by its in-house humanitarians. U.S. pressure—applied at a far higher level and in a far more sustained manner—has made a profound difference with Khartoum in the past, leading it to expel Osama bin Laden and to make essential compromises with rebels in the South. But, at this juncture, U.S. pressure is not sufficient to do the job, and other countries must be brought around. And, for that to happen, the burgeoning endangered people’s movement must spread beyond U.S. shores. Walking away from the rally in Washington, a British friend of mine shook his head and said,“You’ll never hear me say this again, but today made me want my kids to grow up American.”When I asked why, he said,“What happened today could never, ever happen in Europe.” Europeans fond of denouncing both the Rwandan genocide and American imperialism had better prove him wrong. More than 100 leaders of the Zimbabwe Congress of Trade Unions (ZCTU) were arrested on Wednesday as they were about to launch marches to protest at the country's deepening economic crisis. Many of those detained are reported to have been so badly beaten by police that they suffered broken limbs and other serious injuries. Lawyers said their clients were refused medical care or access to their legal representatives for nearly 48 hours. Despite this, union leaders vowed yesterday to continue their protests. The time for commemoration lies very far in the future. War memorials are erected when the war is won. At the moment, anyone who insists on the primacy of September 11, 2001, is very likely to be accused--not just overseas but in this country also--of making or at least of implying a "partisan" point. Anyone who lost their "innocence" on September 11 was too naïve by far, or too stupid to begin with. On that day, we learned what we ought to have known already, which is that clerical fanaticism means to fight a war which can only have one victor. Afghans, Kurds, Kashmiris, Timorese and many others could have told us this from experience, and for nothing (and did warn us, especially in the person of Ahmad Shah Massoud, leader of Afghanistan's Northern Alliance). Does anyone suppose that an ideology that slaughters and enslaves them will ever be amenable to "us"? The first duty, therefore, is one of solidarity with bin-Ladenism's other victims and targets, from India to Kurdistan. Dave's Part: Cuba and socialist democracy: "Beyond a layer of older people who lived through the revolution in the late fifties, there are few strong supporters of the government. The younger a person is - and the darker the colour of their skin - the more likely they are to be hostile. Many of those at the sharp end of the multiple hardships would rather be living in Miami, and don’t think twice about saying that to a foreign journalist. The thing is, Cuba is the last country with even a semi-credible claim to be somehow ‘socialist’. Few nowadays regard China as anything other than an extended neoliberal sweatshop with the chutzpah still to fly the red flag, or see North Korea as more than a famine-ridden hellhole suffering under a particularly ghastly hereditary quasi-monarchy. Accordingly, many lefties in the developed world maintain a soft spot for the homeland of Fidel Castro. After all, the Cuban system wasn’t imposed by the Red Army, was it? It emerged from a genuine revolutionary process that grew over from nationalism to socialism." Perhaps the clearest reason for socialists not to go starry-eyed over the place is the massive social weight of the Cuban armed forces, so typical for Latin America. That is probably the real significance of Fidel’s Castro decision to hand over power to kid brother Raul. Power stays with the guys that dress up in olive green. Intriguingly, the president broke a little news on the subject of Iran, acknowledging that he personally signed off on the U.S. visit this week by former Iranian President Mohammad Khatami. The trip has angered many conservatives because Mr. Khatami presided over the nuclear weapons development and cheating that Mr. Bush has pledged to stop. Why let him visit? "I was interested to hear what he had to say," Mr. Bush responds without hesitation. "I'm interested in learning more about the Iranian government, how they think, what people think within the government. My hope is that diplomacy will work in convincing the Iranians to give up their nuclear weapons ambitions. And in order for diplomacy to work, it's important to hear voices other than [current President Mahmoud] Ahmadinejad's." Jeff Zeleny recaps Obama's Africa trip over at the swamp. Obama talks about his plans for next year's trip. I'd rather Obama introduce a resolution in Congress authorizing the United States to us force to back the UN. The U.N. Security Council last week approved a peacekeeping force of up to 22,500 that would take the place of the African Union troops, but Sudanese President Omar Hassan al-Bashir has sought to block it from being deployed. Two students were killed and 10 wounded in the North Darfur capital of El-Fasher on Monday as troops violently dispersed a rally supporting the deployment of a U.N. force, news reports said. The new push by government forces and the uncertainty surrounding peacekeeping efforts could produce a fundamental shift in the fighting in Darfur, where violence and disease have left as many as 450,000 people dead and 2 million homeless. Aid workers say that in recent weeks, civilian casualties, rapes and looting have grown more widespread. Tens of thousands of Darfuris have surged into camps, voting with their feet against a peace deal that many there regard as deeply flawed. Take a look at them. They're over at Soap Blox Chicago. I'm a liberal on immigration. I was raised hearing immigrants are better Americans then those of us born here, because they chose the United States. So I choke up when I see non-citizens joining the service. I read Spanish surnames in CENTCOM's website and see our next generation of leaders. I understand the illegal part of illegal immigration is a problem, and unpatrolled boarders threaten security. But basically I'm with Bush: grant amnesty and just call it a guest worker program. These ads sure put Duckworth way to the right on the issue (if right and left have any meaning any more). I sure don't like her image here. On Saturday afternoon, Khatami took a campaign line from former President Ronald Reagan. I'm committed to Huber beers and a strong Rhinelander guy; so I won't put a dent into Millers bottom line with the boycott Michelle Malkins calling for here. And some clips from the Trib story that set Malkin off. Marchers had to duck into fast-food restaurants for water when they first took to Chicago's streets in support of illegal immigrants five months ago. At the next two marches, family-owned grocery stores offered free bottled water from trucks emblazoned with their names. This time, as demonstrators march from Chinatown to House Speaker Dennis Hastert's (R-Ill.) Batavia office this weekend, they will have Miller Brewing Co., as a sponsor. The brewer has paid more than $30,000 for a planning convention, materials and newspaper ads publicizing the event. Mathew Romero, the company's local market development manager, said Miller felt it was important to speak out against Sensenbrenner's legislation, though his campaign was one of many the company supported. Romero noted that company founder Frederick Miller was a German immigrant and many current executives are foreign nationals. Miller is now part of London-based SABMiller. I hope these folks show some appreciation while demonstrating of the High Life we -legals and illegals alike- enjoy in Chicago. Prost. Democratyia links testimonies by survivors of Saddam's regime. In the aftermath of the September 11 attacks on Washington and New York five years ago, The Sunday Telegraph published a leading article entitled "There is no third way". We stated that the West had only two choices: to appease the terrorists or to fight them. That choice remains the only one available today. Contrary to what Peter Taylor suggests on this page, no negotiation is possible with al-Qaeda or the fanatical Islamist organisations affiliated to it. Their goal is to destroy liberal, tolerant, secular society in all its forms, and replace it with a rigid theocratic dictatorship that enforces a medieval interpretation of the most barbaric elements of Islamic law. In the conflict between the terrorists who wish to impose their vision of a "just and righteous society" by force on the rest of us, there is nothing to talk about: they are not interested in compromise or negotiation, and there is no common ground between their vision of the future and ours. The terrorists themselves have stated their position clearly: "We are not," one of them has insisted, "trying to exact concessions from you. We are trying to eliminate you."